Company Branding, Logo Design, Business Cards and Website Design; just some areas of my specialties as a web and graphic designer. 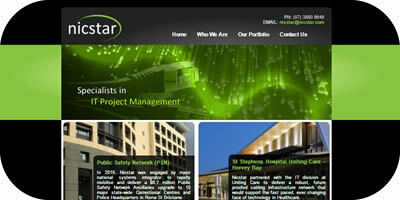 When Nicstar moved to new ownership, they required a new look for the business website. They asked me to recreate the website with a new style and additional information, so I put together something which both displayed their work but also showed professionalism. When Nicstar moved to new ownership, they required a new look for the business yet wanted to keep some similarity so their existing clients would still recognise the business. They asked me to recreate their logo, so I redesigned the logo with a more modern pronounced green curve and the name change (Global is no longer part of the Nicstar name). 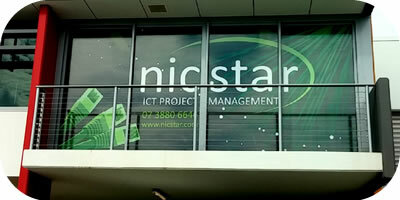 During the change at Nicstar, they moved to a new building and asked me to design advertising to be displayed on the side of the building. So I designed a large piece that displayed their logo as the predominant element, but also included some cat cables and fibre cable design both in the nicstar green to show their work in IT and placed "ICT Project Management" underneath the logo to show they are in fact a project management company. 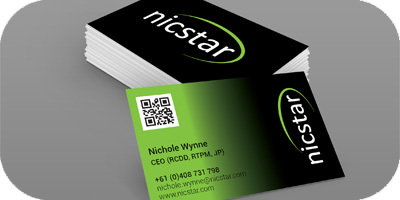 The last of the projects I did with Nicstar were their Business Cards. They wanted a plain front, black with the new logo and the back to incorporate green and black with all required information and the logo. I also incoporated a QR code linking to their website which I felt added more to the card and gave it a professional technical feel. 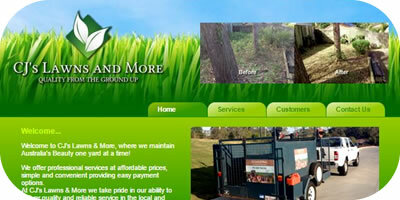 This was a website job I did for Cjs Lawns and More, as a garden maintenance company they wanted a well designed website which perceived what they did and showed all required information. I also included on the website before and after images of jobs they have done to display the effectiveness of their work. 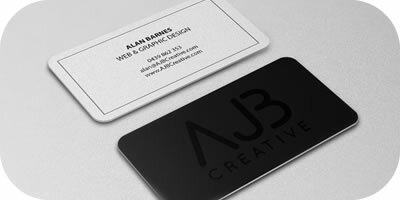 These are my business cards which I designed for AJB Creative Design. The initial design elements I wanted were sharp, clean and professional with an edge (in this case, rounded edges), I thought this would stand out from the standard business card look. The cards were also printed with a raised gloss on the logo to give it a shine which you can feel as you run your fingers over it. These are logos I did for The Fitness Precinct and The Pole Precinct (a department of The Fitness Precinct), the client wanted something with silhouettes showing the different elements of the gym. These are one of the concepts i put together for the client and they were very happy with the outcome. 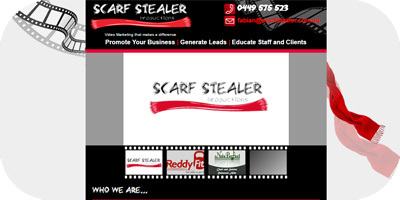 This is a website I did for Scarf Stealer Productions, a company that does quality film projects to help businesses generate leads. They wanted a website to advertise who they were and what they were about but also that displayed their work in a professional design.